April 1 2018 struck a sombre note for Columbo fans with news that Steven Bochco had died at the age of 74 after a long battle with leukemia. I don’t pretend to be a great student of Steven’s work, although of course I’m familiar with many of his blockbuster hits including LA Law, NYPD Blue, Murder One and the seminal Hill Street Blues. However, it would be poor form to not reflect on Bochco’s considerable contribution to Columbo, which commenced in 1971 when he wrote Season 1’s opening episode Murder by the Book at the age of 27. In collaboration with rookie director Steven Spielberg, Bochco created a story that stands the test of time better than almost any other Columbo episode, setting a standard of interaction and confrontation between the Lieutenant and his quarry (in this case Jack Cassidy’s Ken Franklin) that was rarely bested in the show’s 35-year run. For this, he was nominated for an ‘Outstanding Writing Achievement in Drama’ Emmy in 1972, although he didn’t win. He went home empty handed a year later, too, after receiving a nomination for his work on Columbo Season 2 opener Etude in Black. He did, however, win 10 Emmys from his 30 lifetime nominations, the majority for Hill Street Blues and NYPD Blue. Although small compared to his main body of work, Bochco’s Columbo legacy is strong. He also contributed the teleplay to the excellent Lady in Waiting and Blueprint for Murder from Columbo‘s stellar first season – the latter including a scene cut from Murder by the Book when the murderer’s tyre blows with the corpse in the trunk and a traffic cop pulls over to help. It’s a scene of superior tension, so it’s great that Bochco was able to ensure it was finally aired. As well as Etude, Bocho also wrote the teleplay for Season 2’s Double Shock (a great personal favourite of mine) and Season 3’s Mind Over Mayhem. His final outing in Columbo colours came in 1990, when he wrote Uneasy Lies the Crown at a stage in his career where he had essentially established himself as the leading in figure in the episodic cop drama genre. There are many excellent tributes to Bochco that have aired since his death. 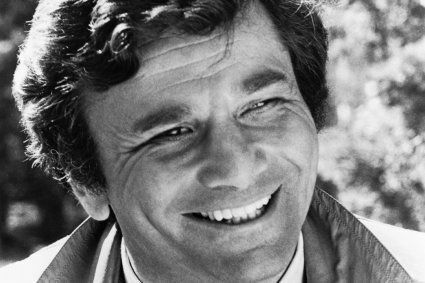 For my part I’m simply grateful that a man of his talents was able to hone his skills on Columbo and create some outstanding memories for millions of fans the world over. As will the entire televisual community. May he rest in peace. You can view a terrific video interview of Steven Bochco talking about his Columbo involvement below. Tags: Blueprint for Murder, Double Shock, Etude in Black, Lady in Waiting, Mind Over Mayhem, Murder By The Book, Steven Bochco, Steven Spielberg, Uneasy Lies the Crown. Bookmark the permalink. This man was truly the genius behind the phenomenal success of Columbo. A sad loss indeed. I think this book written by the late Mr. Bochco might interest some of us here. I happened to be watching Mind over Mayhem when I read the news of Steven Bochco’s death. I knew I had seen his name before, so I started googling, and when I realized he had worked on the episode that was playing right in front of me (among others, of course), it was kind of eerie. Sad loss indeed. Does anyone remember when Patrick Mcgoohan’s character and Columbo gave a shout out to him on ashes to ashes. Sonny Bono,Sandra Bullock and Steven Bochco. So that’s where I recognized his name from! I’m really bad at names in general, but I remember seeing Steven Bochco’s name very vividly in some work I view on a regular basis. It wasn’t his more known work, since I don’t think I really watch any of that, so my initial guess was that I knew him from Columbo. Seems like I was right, but what a loss indeed. a sad loss indeed. RIP, sir.